It’s a Silver Gilt Award for Silloth! In February of this year, Silloth received the news that it had been shortlisted as a finalist in the Britain in Bloom competition in the Coastal – Population up to 12K category, alongside contenders from St Brelade, Newcastle (NI), Bute, Mablethorpe, Filey and Tenby. After months of preparation, various meetings and a lot of work by the whole community, the judges from Britain in Bloom, Keith Jackson and Mark Wasilewski, visited the town on 4 August. 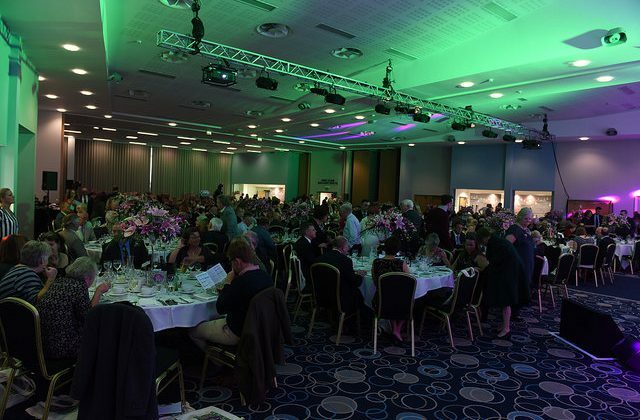 After weeks of trepidation, the Britain in Bloom UK Finals Awards Ceremony 2016, took place on 14 October at Edgbaston Stadium, in Birmingham. Almost 500 delegates from all over the country attended the presentation, with Silloth represented by Bill Jefferson (Chair of Silloth in Bloom), Tony Markley (Mayor of Silloth), Wendy Jameson (Town Clerk and Secretary of Silloth in Bloom) and volunteers, Vivian Russell and Anne Winter. 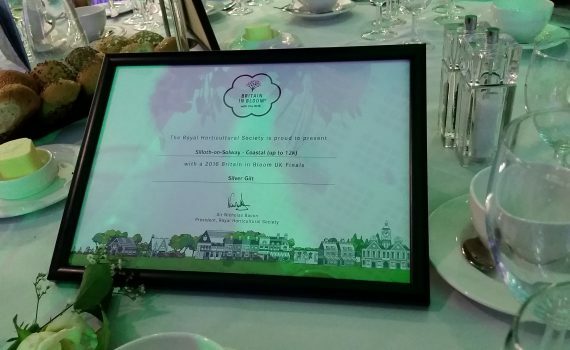 Silloth-on-Solway were honoured to receive a Silver Gilt Award for the Coastal Town (up to 12k) category, with St Brelade in Jersey being the overall category winner. Bill Jefferson and Tony Markley were presented with the award by Roger Burnett, Chair of the RHS Britain in Bloom judging panel. The RHS Britain in Bloom UK Finals brings together the highest achievers from all of the 16 regions and nations participating in the campaign and, as a result, the expectations are high and the judging is rigorous. The judges look for year round achievements in three core areas: Horticultural Achievement, Environmental Responsibility and Community Participation. Keith and Mark, the Britain in Bloom judges said “this first time entry will surely continue to grow from strength to strength and is most certainly one to watch for the future. This young Bloom group could be the catalyst for great change within the community and the judges look forward to hearing of the progress made in the years to come”. Also representing Cumbria at the Awards ceremony were Dalston and Kendal. Dalston achieved a Silver Gilt Award in the Large Village Category and Kendal were awarded a Silver Gilt in the Large Town category, with an additional Award for Overcoming Adversity, for brightening up the town after the December floods. A tremendous achievement by all three groups from Cumbria. The final presentation of the evening was the RHS Britain in Bloom Community Champion Award which is the only RHS award given to individuals, in recognition of their exceptional commitment and dedication to Britain in Bloom in their community. Bill Jefferson OBE, was presented with a well-deserved Community Champion Award, much to his shock and surprise. Bill has been involved with Silloth’s ‘in Bloom’ activities for the last 3 years and is Chairman of the Silloth in Bloom community team. Bill is also a Town Councillor, an Allerdale Councillor, Chairman of the Solway Coast AONB and a member of the Lake District National Park.